I always forget just how difficult the first week of school is. It seems that no matter how prepared I am, it is still difficult! This year, I had a unique situation with my class, in that 10 of my students are new to the school. Because of that, I wanted to make sure that I did plenty of "Get to know you" activities, so that my students could both get to know each other, as well as our classroom and school. I wanted to include some of the things I did this week, in case any of you guys wanted to do similar activities with your kids! 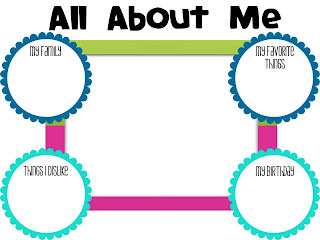 "All About Me" poster--My students and made these the first day of school. I had my students draw a picture of themselves in the middle, but you could also take a picture of your students and paste it in the center. My students really enjoyed getting to share about themselves with their table buddies, and it was a great way for me to get to know my new kiddos. "Beach Ball Madness"--I got a beach ball ($0.75 at Wal-mart!!) and wrote "get to know you questions all around it. We tossed the ball around the room and answered the question that faced us when we caught the ball. I think we had more fun tossing the ball around than we did answering the questions, but it was a great activity for building community. I asked the students to call the name of the student they would be tossing the ball to. "Microphone Mania"--I put my students in pairs and had them make microphones out of black construction paper and aluminum foil. I then had the students interview each other and record their answers. I tried to partner the students up so that they were with students that were not in their class last year--it worked out really well! "Classroom Scavenger Hunt"--I created a scavenger hunt of things I wanted my students to find in our classroom and they had to go and find them. I added things to the scavenger hunt like 1.) If Miss Martin asks you to to keep your voice on Level 2, what does that mean? 2.) Find two books from the Historical Fiction basket and you might want to read. 3.) List one example of an expectation from the "Be Respectful" rule, etc. This activity helped me guarantee that my students know where all of our classroom expectations and rules are, as well as other helpful things in our room. "Time Capsule"--I am super excited about this idea! My students and I created a time capsule yesterday, in which they answered questions about themselves, such as their favorite food, color, etc. I put their answers in a box and we put in at the top of our closet. We are going to leave it up there for the entire year and look at it at the end of the year. It will be fun to see how they have changed! What kind of things do you do with your kids at the beginning of the year?